LumaFix was made to easily remove vertical lines from your C64 image caused by signals also in the VIC-II video chip. It also has an adjustment for the Chroma signal that can help reduce problems related mostly to s-video connection on modern TV:s, the dreaded chequered pattern. 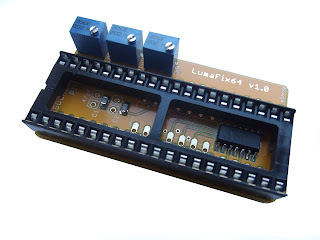 LumaFix64 helps getting rid of the problem by inverting the interfering signals and feeding it back into the Luma signal. We will make up a couple of test units and send them over to the developer e5frog and as soon as we get the OK we will sell them! This is a great little device and I recommend it to people that want to clean up their Commodore's video output. However, there is one caveat. If you have a Commodore 64C with a long motherboard (or you have put a long breadbin motherboard in one of the Dallas Moore cases) you will have fitment issues. With the Lumafix64 installed, the VIC-II's RF shield top must be removed and it cannot be replaced as the Lumafix64 assembly now sits above the RF shield casing. This means that the heat sink finger from the RF shield top is no longer in place, cooling the VIC-II chip and requiring you to install an aftermarket heatsink. The problem is that even low profile heatsinks will interfere with the keyboard. As I do not suggest you run your VIC-II without a heatsink, this presents a problem. In my case I temporarily solved the problem by performing a pretty hideous hack on the heatsink I had, grinding one side of the fins to a 30 degree angle to fit under the angled back of the keyboard. I also had to nibble out part of one of the fins to accommodate one of the screw heads in the bottom of the keyboard that hold the keyboard assembly together. Ultimately I'll probably have to desolder the original VIC-II's motherboard socket and solder the Lumafix64 directly to the motherboard in order to regain the needed clearance. I'm fairly sure that most breadbins and shortboard 64C's won't have these issues, but don't hold me to that as I haven't actually tested any other configuration yet. Hello. Where can I order some? Just contact us, we have plenty. Can I use it on the VIC-II o fthe commodore 128? Already bought two Lumafix64 and I'm an happy customer, just a question: if installed on a 64 breadbin is there sufficient space left to install an heatsink? I installed it on a 64c and seems just few mm left to the keyboard. Is there a specific heatsink you advise? Any plans to make breadbin compatible ones? As the guy above says, there'll be fitting issues. These do fit the breadbin, you just leave off the heatsink. I wonder if Lumafix can be used with SX64 too? Do you still have any available Tim? Can’t find the shop page? simply email sales@sharewareplus.com and we will take care of you.